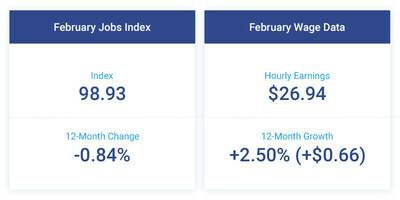 Small Business Hiring Remained Flat in February, While Wage Growth Increased - Paychex Inc.
ROCHESTER, N.Y., March 5, 2019 /PRNewswire/ -- The Paychex | IHS Markit Small Business Employment Watch continued to reflect signs of the tight labor market. 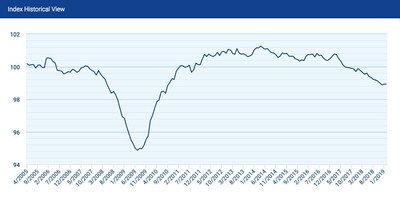 At 98.93, the Small Business Jobs Index was unchanged in February, remaining just below 99. Though the rate of job growth has stayed relatively consistent over the past three months, the national index is down 0.84 percent year-over-year. Hourly earnings growth improved once again from the previous month, up 2.50 percent ($0.66). One-month and three-month annualized growth rates for weekly hours worked were positive in February. 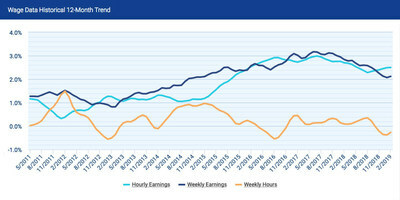 As a result, weekly earnings growth also increased for the first time since last summer. Note: As ofFebruary2019, Baltimore replaced St. Louis on the Small Business Employment Watch analysis of the 20 largest metro areas based on U.S. population.